There are many ways to look at my father’s long life. You can look at it through the lens of history. He remembered having one of the first phones in Yakima with its three-digit phone number, and died in a world that had been transformed by technology. You can look at it through the lens of medicine. He was a walking miracle who lived 50 years after his first heart attack, having survived three open heart surgeries, two more small heart attacks, and three strokes. You can look at his life through the lens of professional accomplishment, a tough, smart Marine who was twice decorated with a bronze star with V for valor and who was unafraid to challenge his superior officer even when threatened with court martial. But I think of my father’s life as a love story. He was a middle child in a difficult family. He loved his mother deeply but feared his father, who he referred to as “The Great I Am.” Dubbed “the smart one” by his family, he was accelerated in school by two years, which he said was a disaster for any young man with an interest in young women. He didn’t stand a chance. In his writing, you could hear the words of a romantic. Meant to be the family lawyer, he was in love with words. He began to devour and memorize large swaths of poetry, with favorites including Shakespeare and 19th century poets. Then he met my mother, and the next chapter in his love story began. As my Dad told the story, it was spring of 1939 at the UW, Dad’s senior year. The story was always told the same way: after drying himself out from a binge in the taproom, he seated himself in Dr. Padelford’s class on Robert and Elizabeth Barrett Browning where they would study “The Ring and the Book.” Whereupon he saw “this vision enter the room, dressed to the nines.” As my grandfather said when he met my mother, “Son, a pretty face will fade away, but a good pair of legs will last forever.” Soon the cherry blossoms were in full bloom on the quad, and the girls shed their bulky sweaters and began walking around in diaphanous skirts. If ever an immovable object met an irresistible force, it was my father meeting my mother. My mother, upon learning that Dad was pinned to a girl in Yakima, handed him $5 for train fare and told him not to come back until he had the pin. In 1941, after Dad had been commissioned as a second lieutenant and was stationed in Quantico, Mom sent him a cryptic telegram saying that she accepted his proposal and was heading east with her mother to get married. He swore that he had no recollection of any such proposal. My father, concerned about the limited longevity of second lieutenants during war time, didn’t want to start a family; but my mother told him in no uncertain terms that he was not going to go off to war without him leaving a piece of him behind, and in November 1942, Scott was born. Fast forward to 1999. Though I knew of Dad’s love of poetry and Mom, I don’t think I truly understood how driven he was by love until after Mom died. If I may mix my metaphors, when my mother met my father, they were two elements that combined to form a compound. (I’m no chemist; I’ll let you figure out which two elements.) I didn’t have a lot of insight into my father’s experiences and feelings until after his life-long confidante was gone. 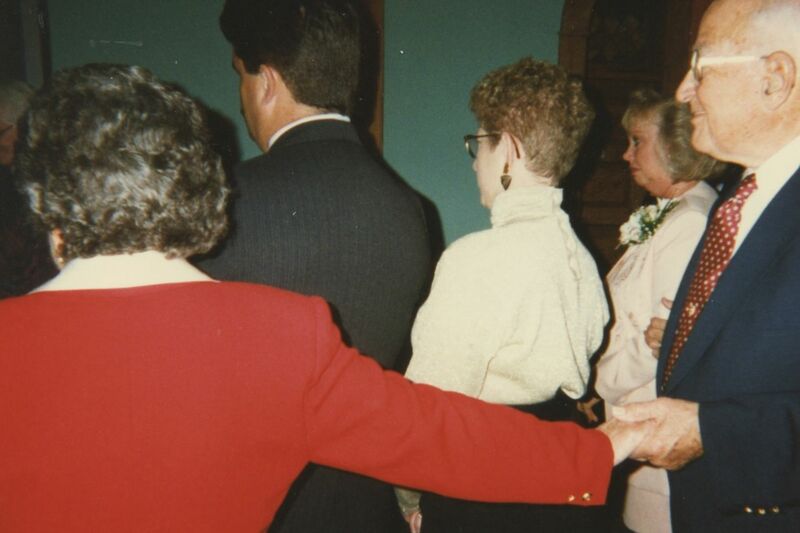 At the end of Mom’s 3 ½ month illness with late stage lung cancer, at sunset on May 10, 1999, I called my father in to their bedroom after I noticed that Mom’s color had changed; while I called hospice, he held her hand, told her that he loved her and that he would be with her again. Then her heart stopped. As we sat together in the days that followed, recollections began to spill out from him. First he recalled Mom. As I wrote later, “In the days after my mother died, my father recalled some of their intimate moments like movie images, how she looked with the glow of moonlight on her body.” It would have been a beautiful moment were I not trying to block that image out of my mind…. Then he began to talk about the war, something he had rarely done throughout my lifetime. He described being in the Japanese pillbox that had been cleared and that served as the command center on Iwo Jima. A huge shell went off just outside. He pointed from my parents’ front door to the dining room and said that the shell left a crater that large. He said that some fine men were obliterated by that shell, many he knew, some he was proud to call friend. But the most difficult memory he shared with me was that of the final illness of my sister, Midge, in 1953. Dad sat on the couch and described her in her oxygen tent in the hospital, reaching out her arms toward him, and saying, “Daddy, help me.” He said that he went out in the hall and pounded on the wall with his fists. “I could do nothing,” he said. As he told me the story, he repeatedly slapped his forehead, not gently, but hard, crying. I finally took his hand and told him to stop hitting himself. In 2006, I invited Dad to move to California, figuring that he was, as I put it, “past his expiration date.” The cardiovascular surgeon who operated on him in 1999 had projected that the surgery would give him lasting relief for only about five years. Then his heart disease would likely end his life. The ensuing seven years were transformative, for Dad and for me. I listened as he worked through the most important experiences in his life. His love of Mom. The War. The Loss of Midge. His difficult relationship with his father. His love of his mother. Like all of us, he had regrets or things he never understood. Perhaps my father’s biggest challenge was his final one – the grueling march of his final years. His physical abilities were seared away by time. He lost his hearing. His balance faltered. His chest pain increased. His breathing became strained. It became brutal to watch. But what remained was Henry, distilled and pure. He loved red roses, which represented his love of Mom, and for several years after Mom died, he sent them to his favorite women: his daughters in law, his niece and me. He still loved chocolate and enjoyed his last bowl of ice cream with chocolate sauce the evening before he died. He cared about the future of the nation, and voted in his 19th presidential election last year. He still loved and worried about us, his adult children. I asked him once, “Do you ever stop worrying?” and he said, “No, never.” He often asked after his grandchildren, and even his great grandchildren. I said this was a love story, and so it is. On the day my father died, he was agitated. His time was near, though we did not guess how near. At about 11 a.m., Maddie comforted him by reading poetry from the little book of his favorite poetry, “Henry’s Passages.” She read Longfellow, and Shelley, and, of course, Shakespearian sonnets. Around 3 p.m., after being unresponsive most of the day, Dad suddenly smiled. And shortly before 6 p.m., his eyebrows lifted, as if he was seeing someone who delighted him. And his lips began moving as if he were speaking to that person. Dean and I felt that he was seeing Mom. When Dean and I realized that Dad’s breathing suddenly changed at about 6 p.m., Dean held Dad’s hand, and I started reading Shakespeare’s Sonnet 130, which was the last sonnet Dad recited from memory, several days before. Then his breathing slowed, and finally stopped altogether. Henry Snively Campbell – loving friend, son, brother, uncle, husband, grandfather, great grandfather, and father — died in a state of love, which is to say, a state of grace. It’s 2:51 a.m. and I can’t sleep. About an hour ago I emerged into consciousness with the lingering memory of a dream. It’s short — perhaps three seconds — but it keeps repeating. The frame is small, just big enough to show my legs standing on a patch of grass out of which a tree trunk is poking, in one of those planted strips between sidewalk and street. I look down and notice that the ground in front of me is sprinkled with small white spheres. They’re about the size of Pop Rocks and maybe it’s that association that makes me want to put one in my mouth to explore its taste. In my mouth I realize that the ball isn’t perfectly smooth; it’s rough enough to abrade the tender lining if I’m not careful. It bumps against the ridged roof of my mouth when I press and roll it with my tongue. Salty, I realize, very. The salt stings and makes my mouth water. Poor trees, I thought, poor grass, to survive such an acidic assault. Now that I am awake enough to review the little movie, I realize the image is layered. I see round typewriter keys lighting up individually as I imagine writing this account; a close up of the ground littered with the white balls; and mid-range, as if across the street, a shot of the tree, its roots blanketed by sod. The images are simultaneous. I can pull back the film of one to study the one beneath, or choose to look at them all at once, the keys on top of the grass on top of the street scene. Which made me think of photos I took at my dear classmate Mimi’s memorial. Her death was unexpected, and a stunning loss to her family and friends. Around the perimeter of the garden setting, someone had framed enlarged pictures of Mimi at different points in her life. As a child, with her sister. As an alluring young woman. As a mother. As a breast cancer survivor. When she lost her hair, she decided to mark her battle by sitting for professional photographs. In the large image, she faces away, her arms gracefully folded atop her head, her sinuous spine bending to the side. Her dark skin is bold against the white background. Although I don’t know what process the photographer used, I imagined silver nitrate concentrating in the shadow along her spine and in the dark hair follicles on her smooth skull. Below the big photo is a smaller horizontal one of Mimi gazing upward, as if considering her transformed body. I took a picture of the picture. When I checked the image, I realized I’d captured a reflection. A quietly composed woman, seated on a chair, appeared in a patch of light on Mimi’s back. Now I had a picture of a young woman embedded within the original one. I thought, even when she was ill, healthy Mimi was inside. And Mimi, the warrior, was always inside the healthy woman. In a David Menaker story, the wife is described as having a poor memory of conversations. The narrator-husband writes, “They seem to light up the neurons in her brain and then fade away quickly and entirely, like subatomic particles in a cloud chamber.” I’m like that. I come away from things with a fuzzy impression, often failing to store the details, which is a decided weakness in someone who aspires to write. But the dream makes me wonder if I’m perceiving but failing to stop and notice. Perhaps the triple vision of the dream means that we have the potential for multiple perspectives: the close-up exploration, the mid-range sense of ourselves in a space, and the distant assessment — all three at the moment that something is seen or heard, tasted or touched. Something happened when I posted the photos of Mimi’s memorial on a private page where my writing classmates share news and musings. I uploaded eleven photos and posted a short report on the memorial. The photos showed up in Facebook’s collage mode, five images with a “+6” that indicated there were more. I folded my computer and attended to a small chore. When I returned to my computer a half hour later, one image had posted separately, seemingly by itself: a photo of Mimi dancing. Her arms are again raised, but blurred, caught in movement. Below a short white jacket, her stiff skirt flares, fluffed to fullness as she spins. In the original image, the focus is on Mimi, dancing in the dark, the only other detail being the nose of a black Mercedes. In my image, a white peony is attached to the framed photo, and the image is altered by a new element: the reflection of the garden where her friends gathered to celebrate her life. She seems to be watching the gathering, or perhaps hailing her friends. After I recovered from my shock, I thought perhaps Mimi decided to have the last word: remember me like this. A little heartbreaker on my way back from workout this morning. A familiar elfin woman strolled down the street, her hands clasped behind her back. Should I ask her? Until a few weeks ago, she’d always been with her husband. The two looked like the movie trope about the sunset years, in which the elderly couple walks hand in hand, smiling. And something about her reminded me of my mother. They were a neighborhood fixture, along with the woman who walks her two horses, the young parents with the double-wide stroller and two wiemaraners, and the walking-talking lawyer, always on a moving conference call. But the couple was my favorite. I imagined my mother and father into their shoes, living their last years together. I didn’t know what to say. I mumbled that I’d always enjoyed seeing them out together and had noticed his absence. I felt it now, and was sorry for her loss. “He was brave to the end,” she said, with her faint German accent. Her smile was still there, politely friendly to this inquiring stranger. Her eyes watered. I remembered sitting with my father on the couch in my parents’ living room the day after my mother died. My mother was everywhere and nowhere. The living room had been redecorated with the help of an interior designer, but the scheme was all her. She chose light gold for the walls, carpet and drapes to compensate for the days the clouds hid the mountains and the landscape turned gray. She hated the dark. Of course there were pops of red, her signature color: true-red cherry blossoms on the Japanese screen, pink-red cranberry glass on the window sill, wine-red velvet on my grandmother’s chair. Next to the couch were the leather-topped end tables for which she constantly admonished us to use a coaster; one had a cigarette burn. I couldn’t imagine her having caused it, even after a glass of wine. She gave up smoking a few times but never kicked the habit. In fourth grade, I conducted my first communications campaign, barraging her with block-lettered “ads” bearing the P.S., “I don’t want you to die!” In the end, smoking killed her, but dementia robbed us of her before that. I didn’t know how my father would live without her. They were one until death split them asunder. But in grief there was still memory. At least he still had her image, the moments bad and good. Toward the end, my father said he could no longer remember my mother’s face. That struck me as cruel on God’s part. How could she go missing? The old couple, walking down the street, always holding hands, allowed me to construct an image of my parents together. A pretend game that gave them back to me, just for a minute. The couple never knew. I never said a word until today. When the woman turned to me, inside the protection of my car, her grief was naked. I hope I let her know that it mattered, that a stranger noticed her beautiful partner was missing. I hope his memory never will be. Writer’s note: I’ve been silent while working hard on manuscripts for my Bennington College Master’s in Fine Arts in Creative Nonfiction. Graduation in June 2016, fingers crossed! Most of what I’m writing doesn’t quite fit the voice of “The Henry Chronicles” but periodically you’ll find me back here! It’s now been two-and-a-half years since my father died. Sometimes it seems longer ago, and sometimes like a few weeks ago. I continue to learn from him even now.